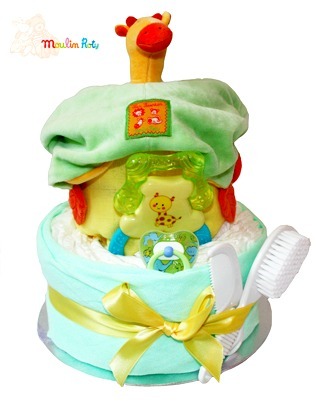 A collection of truly stunning and original neutral nappy cakes that make the perfect new baby gift for both boys and girls. This collection includes nappy cakes to suit all budgets and all are offered with the choice of personalised ribbon should you wish to choose this. We have included neutral and organic cakes as well as very popular animal designs, which have proved to real favourites as they are a little different from a regular cuddly teddy. We also have a lovely choice of the high quality branded French design of soft toys used in our nappy cakes, that being Moulin Roty.